The Bible tells us on Proverbs 18:14 that it is the spirit of a man that sustains him in weakness. We know that we must feed our faith and starve our doubts. 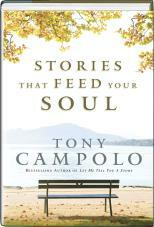 Faith comes by hearing and also by reading this wonderful book by Tony Campolo, "Stories That Feed Your Soul". Through a variety of short yet poignant entrees, Tony continues to feed your faith page by page. In just a few moments you can snack on several encouraging items and find yourself smiling, lifted up in spirit and on your way. In other words your health and your good fortune are tied to how well the soul is doing. Take your soul out to dinner and feast on this one!